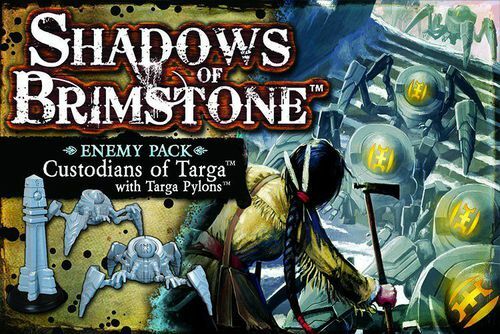 Shadows of Brimstone: Custodians of Targa | Azazel's Bitz Box. I didn’t originally intend to paint these once I got over the hump of 30 figures for April. As they’re a bit silly looking and to me, rather Meh, aesthetically overall. But since they go with the Pylons I did last week and assembly was super easy, barely an inconvenience, I decided to go ahead and do them anyway. 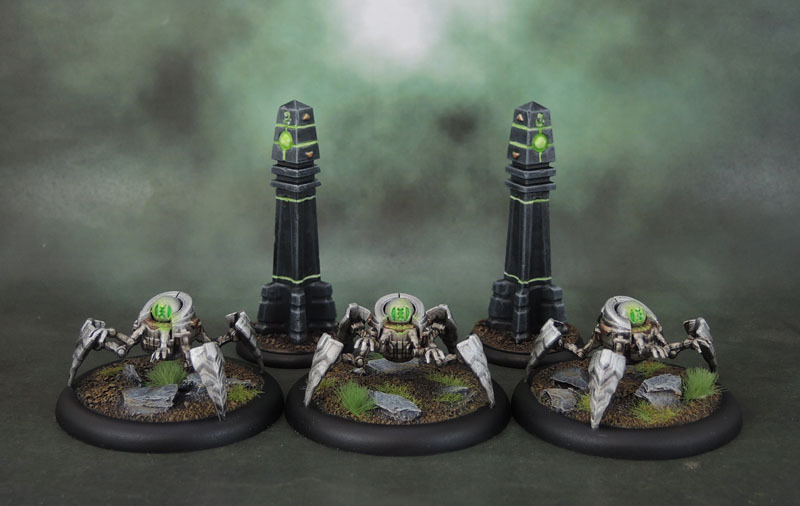 They don’t actually come with bases, and are too large for 32mm or even 40mm Citadel bases. I’m wasn’t going to waste a Citadel 50mm base on them (I don’t have all that many spares, being a newer size) and they looked clownish on 60mm bases. Luckily, a big bag of 50mm rolled-edge, WarmaHordes-style bases came to my rescue. I was able to perch them on the rolled edges, and they actually look quite decent and appropriate on them. As you can see once again, they’re very simple models. The only assembly was dropping their ball-heads into the sockets. Black Spray, Silver Spray, Black Wash, Silver Drybrush, Chrome Drybrush, Balthazar Gold bits, picked out with Model Air Copper, Strone Tone Wash, White Wash in the lenses, followed by a Moot Green wash for colour. Waystone Green in there on top, and we’re done. 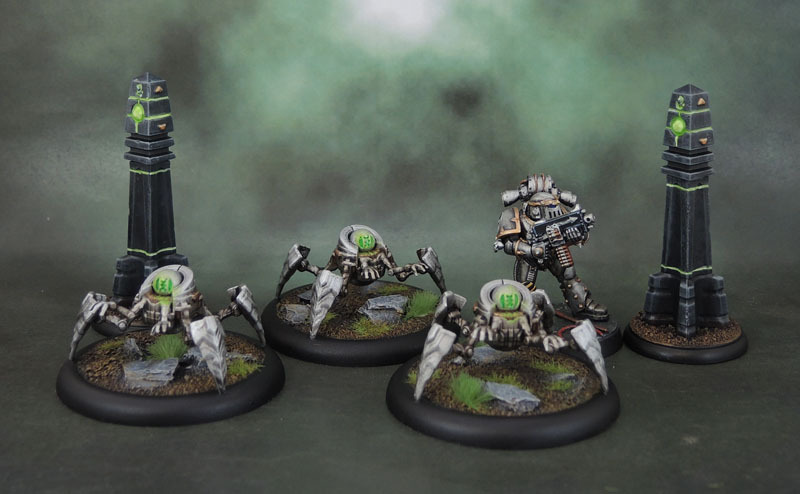 As with the Pylons, they could be Necontyr something something, or simply large spidery AdMech Non-Combat Servitors, as they lack any obvious weapons. Maybe Servitors for my Iron Warriors? I could even use them for Shadows of Brimstone, in a pinch(!) I realised that I didn’t provide any scale reference for the pylons the other day, so this Iron Warriors Marine does the trick for both sets. This entry was posted in Board Games, Sci-Fi Gaming, Shadows of Brimstone and tagged Custodians of Targa, Shadows of Brimstone, Targa Plateau. Bookmark the permalink. Those look cool! I don’t know what I’d use them for, but at US$20 for two Pylons and three Custodians, if I do think of something, they seem pretty reasonably priced. Yeah, they’re not a bad set. The figures are really simple, but if you have a use for them it’s a bit of a bargain. I’ve got to make myself not convert them into something cooler (Admech servitor torso on top?) because I’ve got the boardgame and need to keep that in mind – 40k-and so forth comes under additional useage, not primary! Oh no! I like these as well! And they’ve sort of got shiny beads for heads, so I’ll have to get some! I think they look really good! Just make sure you have some bases for them. They look much less good without bases. Thanks mate. I’m sure you could have a lot of fun with these models! Yep, perfectly serviceable Necron/AdMech drones dude – nice job! 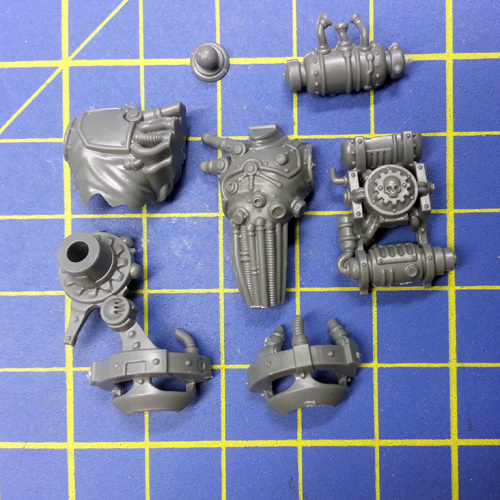 They’d look much better for that with a torso (necron, servitor) dropped in their instead of the shiny bead-head, but as I mentioned to Alexis above, 40k needs to be the secondary use for these ones. I wonder what they would look like with a Skull head dropped in there. Because, you know, skulls! 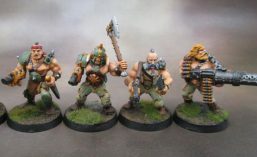 Nice paints and your bases really bring them to life. Reminds me I need to work on my basing skills. Skulls could work, though they’re pretty big for Imperial Scutters. Heresyofus has some nice resin/3d printed ones that he’s put together. I was thinking of something like one of the Kataphron torsos dropped in there, though without the giant gun for a right arm. Thanks for the comment about my bases. The biggest “jumps” I’ve made in decades beyond painted sand and static flock were adding different types of tufts as well as the static grass, smashing up some slate tiles, and learning to incorporate the GW crackle terrain paints (into some figures). All pretty easy, I have to say!